It has recently been demonstrated that honey bee viruses are not, in fact, exclusive to honey bees. Many native bees carry honey bee viruses, but there is nothing known of the effects on the native bees (which are typically solitary bees). 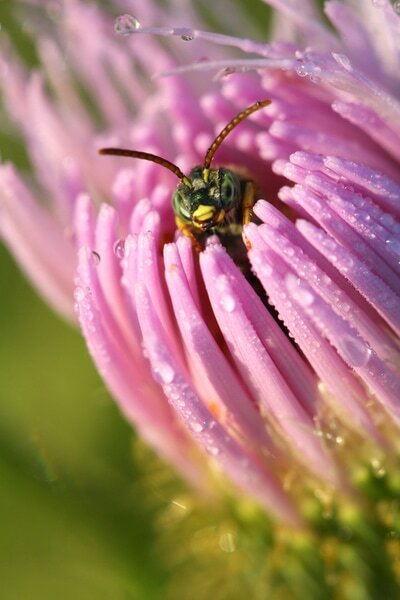 Native bees are important for their ecological services and have been shown on a per-visit basis to be better at pollinating apples than the honey bees that often are rented for orchards during apple bloom. I've been working on a project quantifying the incidence rates and viral patterns of three different viruses in both honey bees and some common native bees (Andrena spp. [cool 1 min video link]) across five different apple orchards. We measured the presence/absence of these viruses shown below, which are three of the most common honey bee viruses in the United States. Solitary native bees (Andrena, from the subgenus Melandrena) and managed, social honey bees (Apis mellifera) were collected as they pollinated apple flowers, and >200 individuals were tested in the lab through sterile gut dissection. We also sequenced >70 strains of BQCV for analysis of the evolutionary relationships. We found that BQCV was the most common virus in both honey bees (72% of 109 tested) and Melandrena (31% of 135). Additionally, our data show honey bees have a higher incidence of each of the three viruses than do the native Melandrena spp. Many more of the honey bees carried all three viruses at once (14%) in their gut than did the native Melandrena (<1%), who usually did not carry all three viruses. 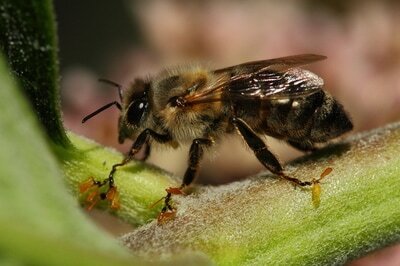 What next for bee virus research? Currently, >24 viruses have been recorded in honey bees, and at least 11 of those have also been documented in native bees. We don't think these should rightly be considered 'honey bee viruses' due to the fact we have no idea of the current host range or original host. 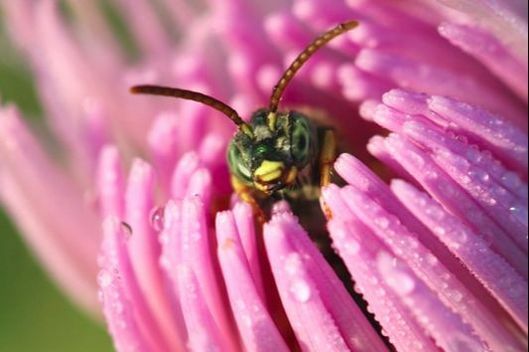 Since nearly nothing is known of viruses in solitary bees, there is much work to be done -- especially in areas such as virus transmission dynamics, effects on individual bees or nests, and viral epidemiology. Our work is now published (Environ Microbiol., March 2019). 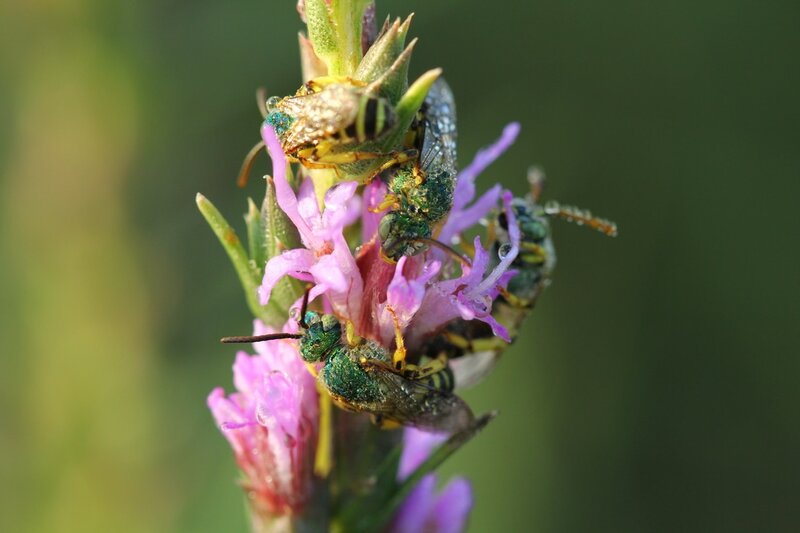 Viruses are one more threat to our pollinators -- other active areas of research include pesticides, pathogens, landscape effects, & habitat loss -- so expect to see an increase in research on native bee health and conservation. citation: Murray, E.A., Burand, J., Trikoz, N., Schnabel, J., Grab, H., Danforth, B.N., 2019. Viral transmission in honey bees and native bees, supported by a global black queen cell virus phylogeny. Environ Microbiol. 21, 972–983. Blitzer, E.J., Gibbs, J., Park, M.G. & Danforth, B.N. (2016) Pollination services for apple are dependent on diverse wild bee communities. Agriculture, Ecosystems and Environment, 221, 1-7. Levitt, A.L., Singh, R., Cox-Foster, D.L., Rajotte, E., Hoover, K., Ostiguy, N. & Holmes, E.C. (2013) Cross-species transmission of honey bee viruses in associated arthropods. Virus Research, 176, 232-40. McMahon, D.P. et al. (2015) A sting in the spit: widespread cross-infection of multiple RNA viruses across wild and managed bees. Journal of Animal Ecology, 84, 615-24. Russo, L., Park, M.L., Blitzer, E.J., & Danforth, B.N. (2017) Flower handling behavior and abundance determine the relative contribution of pollinators to seed set in apple orchards. Agric Ecosyst Environ, 246, 102-108. Singh, R. et al. (2010) RNA viruses in hymenopteran pollinators: evidence of inter-taxa virus transmission via pollen and potential impact on non-Apis hymenopteran species. PLoS One, 5, e14357. Tehel, A., Brown, M.J. & Paxton, R.J. (2016) Impact of managed honey bee viruses on wild bees. Current Opinion in Virology, 19, 16-22. Images copyright Andrew Murray (my brother). See more of his photographs here.